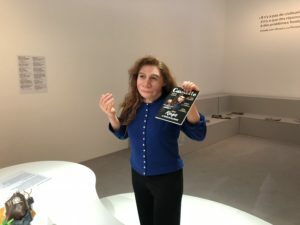 A neanderthal in agnès b. Last week I visited the Neandertal exhibition at the Musée de l’Homme in Paris. The show was instructive and lively. And reasonably busy, for a Friday morning. There is clearly public interest in our nearest prehistorical kindred. Just why this should be, I’ll hazard a guess at the end of this post. There wasn’t too much about parietal art. But I did learn plenty which cast a new light on the eras in which Lascaux, Chauvet and Altamira were created. Perhaps you already knew, but Neanderthals were the first hominid species to bury their dead. Neanderthals and homo sapien interbred and as a result most of us have a slice of their DNA. And given that, it is a disturbing fact that our evolutionary cousins practiced cannibalism. At the end of the show we were met by this young woman, the work of French sculptor Elisabeth Daynès. She has the physique of a neanderthal, but the gaze and the expression of a contemporary. More confusing still, she’s dressed in a Parisienne fashion brand, agnès b. In her left hand is a magazine in which she graces the front cover. She’s so smart and upbeat, one is quickly drawn to her. But then since she also looks something less than fully human, one becomes confused and slightly spooked. There are any number of neanderthal mannequins in museums around the world. Some of them may be made by Daynès, since that is her artistic focus. But the neanderthals who take their place in your average archaeology display are beetle-browed savages; a world away. But his cave person walks among us, the most stylish individual in sight. This sculptor highlights our common ground. Then leaves it to you to sense your radical difference from this model. So how can a major museum sustain a major show on a topic like this? Well, for a start there is a greater interest in prehistory in France. The country has much of the world’s most celebrated cave art. And, I saw for myself that Bookshop Gilbert Joseph, on the Boulevard Saint-Michel, boasts an entire section given over to the Stone Age. But perhaps more than anything, Neandertal fascinates because its subjects are extinct. They are as tragic as dodos, and perhaps more instructive. Hard to imagine a future in which we feature in a museum display, but surely we must hope there is one. Neandertal is at the Musée de l’Homme until 7 January 2019.